Section 1: Arts andCultural Management: Exploring the Field. 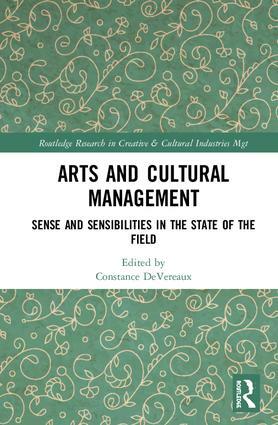 Chapter 2: Arts and Cultural Management: A Brief, Comparative in Curricular Design (Fang Hua). Chapter 3: Towards a Sociology of Arts Managers. Profiles, Expectations and Career Choices (Vincent Dubois and Victor Lepaux). Chapter 4: Situating Cultural Management (Anke Schad). Chapter 5: Death of the Arts Manager (Aleksandar Brkić). Section 2: The State of Arts and Cultural Management Research. Chapter 7: The Orthodoxy of Cultural Management Research and Possible Paths Beyond it (Goran Tomka). Chapter 8: Why are Evaluations in the Field of Cultural Policy (Almost Always) Contested? Major Problems, Frictions and Challenges (Tasos Zembylas). Chapter 9: Arts Marketing: A New Marketing Art (Patrick Germain-Thomas). Chapter 10: The Reality of Cultural Work (Kerry McCall). Section 3: Arts and Cultural Management Discourses. Chapter 12: Silence in Cultural Management (Njörður Sigurjónsson). Chapter 13: Managing Utopias—Artistic and Creative Visions and Implementation (Volker Kirchberg). Chapter 14: Toward a Practical Theory of Managing the Arts (Julian Stahl and Martin Tröndle). Constance DeVereaux, is the Director of the LEAP Institute for the Arts at Colorado State University, USA.